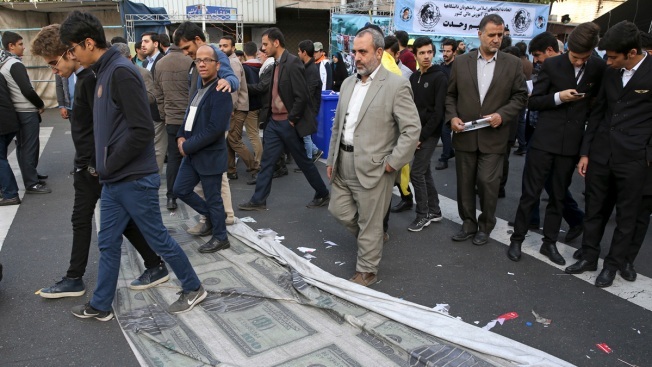 Demonstrators walk on a banner showing altered images of U.S. banknotes with a picture of President Donald Trump on the ground during a rally in front of the former U.S. Embassy in Tehran, Iran, on Sunday, Nov. 4, 2018, marking the 39th anniversary of the seizure of the embassy by militant Iranian students. Thousands of Iranians rallied in Tehran on Sunday to mark the anniversary as Washington restored all sanctions lifted under the nuclear deal. Iranians already struggling to get by amid spiraling prices fear even more hardship is on the way with Monday's restoration of crippling U.S. sanctions. At a Tehran pharmacy, customers said medicines were already getting further out of reach. Manijeh Khorrami, who had come to buy tablets for his diabetic mother, said the Iranian-made version's price had tripled since the summer and the foreign version was no longer available. "Can it get worse than the current situation?" Khorrami said. "I don't know what will happen." The new sanctions end all economic benefits America had granted Tehran for its 2015 nuclear deal with world powers, though Iran continues to abide by the accord, which requires it to curb its uranium enrichment. 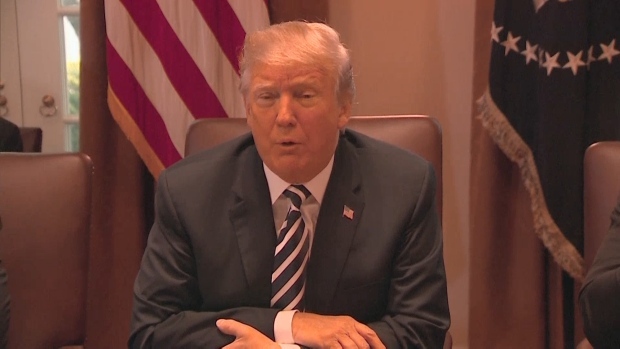 President Donald Trump withdrew from the accord in May, saying it did not address Iran's regional military activities and other issues. Iran's national currency, the rial, has plummeted for months and is now trading at 150,000 to one U.S. dollar, compared to around 40,500 a year ago. The new sanctions will likely undermine the rial even more since they target Iran's oil industry, a crucial source of hard currency. They also target dozens of Iranian banks, aiming to push the financial sector deeper into isolation. The result has been skyrocketing prices for everything from clothes and transportation to food. "Check the shops here one by one, there are no customers," said Hossein Ahmadi, whose purse shop is located on a normally busy commercial street in the Iranian capital. "People have kept their money for rainy days out of fear of sanctions while rent of the shop has gone up." "I don't know how to explain this to my wife and children," he said. At nearby clothes shops, a few women looked through the scarves and coats. "A lot of people are not able to buy these things anymore," said one 22-year-old shopper, Mina Sholeh. Washington has issued a list of 12 demands Iran must meet to get the sanctions lifted, including ending its support for regional militant groups, withdrawing from the civil war in Syria — where it backs President Bashar Assad — and halting its development of ballistic missiles. On Friday, Trump said the objective is "to force the regime into a clear choice: either abandon its destructive behavior or continue down the path toward economic disaster." In large part, the bet is that Iran's leadership will be pressured by public outrage. Iran's economic chaos sparked anti-government protests at the end of last year which resulted in nearly 5,000 reported arrests and at least 25 people being killed. At the time, the Trump administration cheered the protests. Demonstrations have become sporadic and rare. But bitterness remains among many Iranians who complain about corruption and their government's costly interventions in Syria and Iraq. "The government is wealthy, it sells oil abroad but it does not care about ordinary people," said Mohammad Ghasemi, who sells scarves on a street corner. "They waste money where it does nothing to cure the wounds in our heart."